This is the last entry of the Forbidden City series. I am sorry if ONE of you got bored. 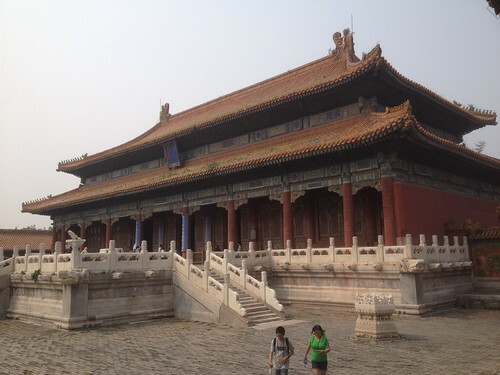 In all, I spent a total of almost 12 hours over 2 days, on my feet wandering the Forbidden City. It was most educational. As huge as the entire place is, every single intricate detail was not spared. 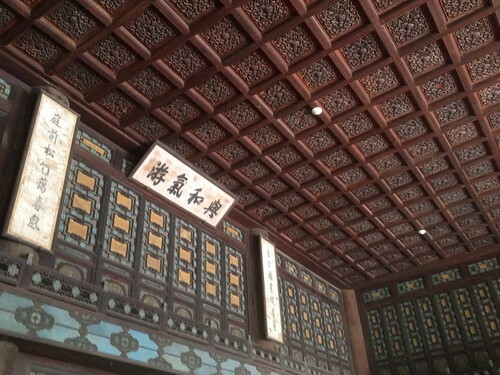 A tilt of the head upwards and you will be awed by the massively detailed carvings on the ceiling. My only regret is as much as words are put into describing the place, one still has to personally go to the Forbidden City to fully experience it. My parting thought as I completed the visit was thinking about the value of this Forbidden City. The antique treasures and all. Let's not even get into the value of the real estate of which the Capital is built around this Forbidden City aka, this is the smack center of the Capital. And for the Last Emperor Puyi and the Empress Dowager to lose it all, they must have really screwed up big time. As gloom as it may sound, it is also somewhat a blessing in disguise since if not for the fall of the monarchy, none of us would have been able to appreciate the entire city both inside and out today. Arrenn: I don't feel bad coz it's my blog to begin with and I write what I want to write and not what people want to read. They can go to Bandung Vader's blog for that. To make fonts bigger, try pressing "Ctrl"+"=". The make smaller is "Ctrl"+"-"
Thanks for the tip, but the aim is so they can't read too much of it lar... -_-"""